Spring is almost here! The weather’s getting brighter, the temperatures are rising and nature is blooming. The Fashion and beauty world has been inspired by the flourishing florals this year. 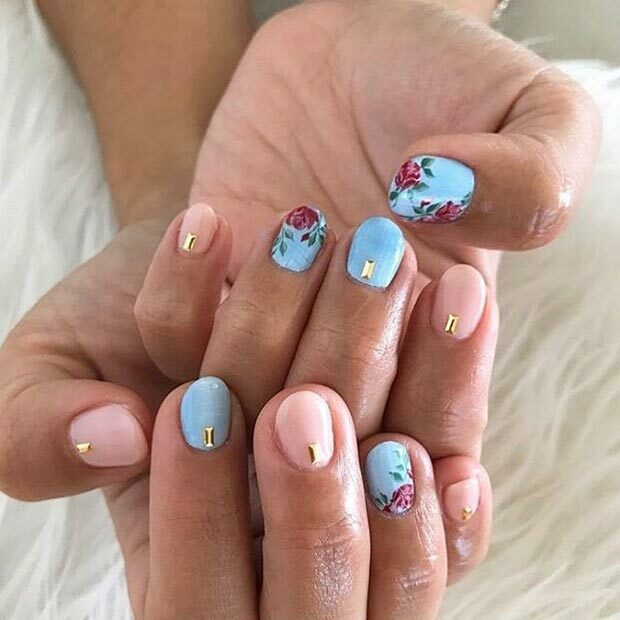 A stylish way to wear this floral trend is with nail art. So, take a look at our 21 best picks of flowery nails that are a spring 2017 must have! If you like experimenting with your nails, then these are for you. These cute flowers will brighten up any outfit for spring. Creating this look will require a steady hand and some practice – as it can be a challenge using your non-dominant hand! 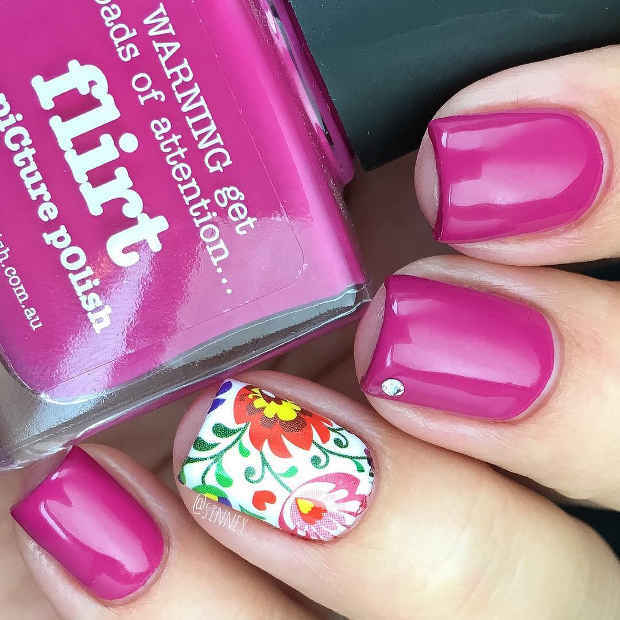 With patience and vibrant nail pens you can create beautiful nails just like these. The next nails are statement makers. These have lots of small elements like different polishes, flowers and crystals that create a stunning overall look. 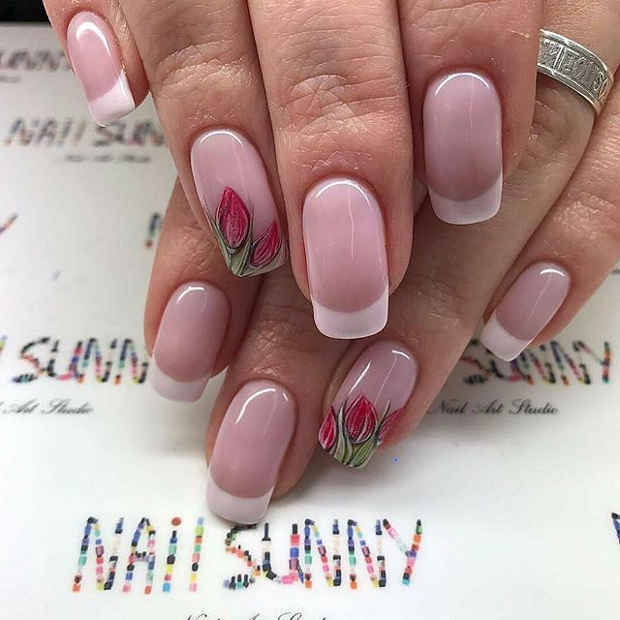 At first designs like these seem very difficult but when broken down into steps it shows that any nail enthusiast can re-create a similar style. White is a spring and summer favourite. The shade works so well on nails because you can wear as it is or add some beautiful little flowers like these. 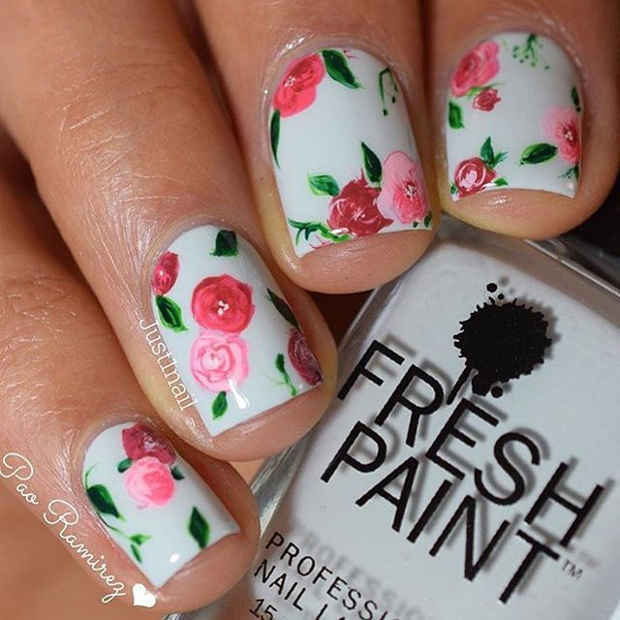 Floral white nails look elegant and trendy for any occasion. White is a great staple polish as it goes with all colors so you can experiment with different flowers and patterns. Roses are a symbol of beauty. 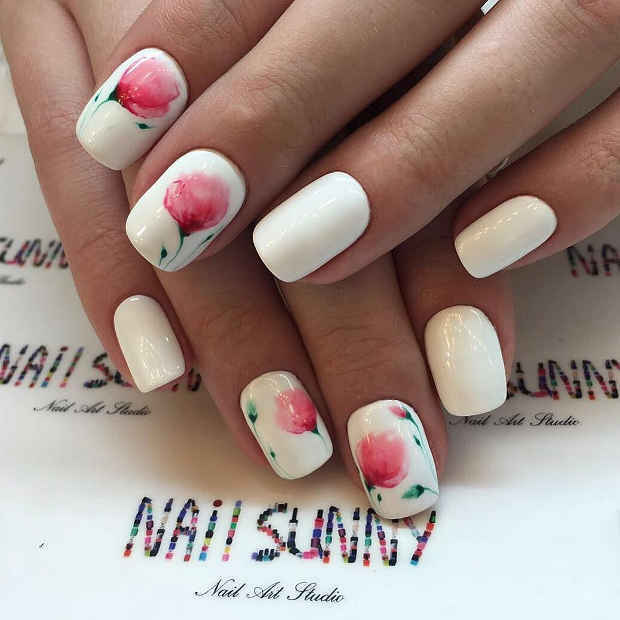 So, give your nails a beautiful spring makeover with simple rose art. You can create gorgeous designs like this one with two polishes and a toothpick. It really can be that simple and there are plenty of tutorials online. Add some little crystals for a glam finishing touch. 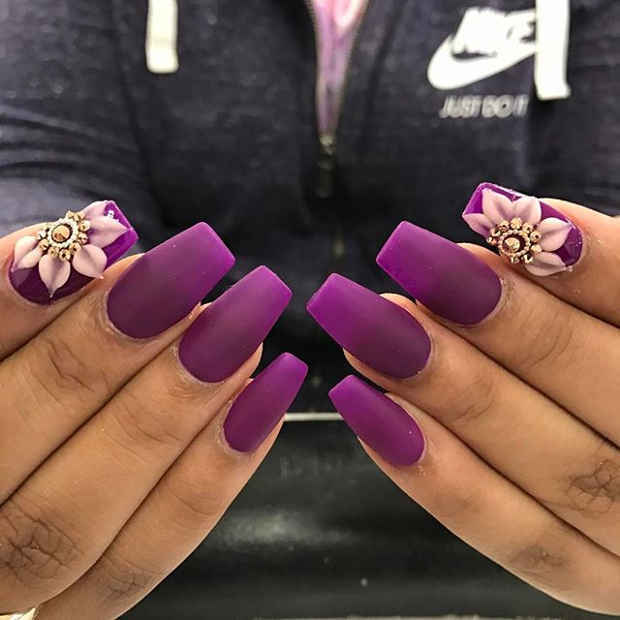 Trends for the spring are about being bold and experimenting with new styles, which is what nails like these are all about. You can create a design like this one by using different transfers and wraps. Choose some floral stickers, different polishes and little crystals and have fun mixing and matching! 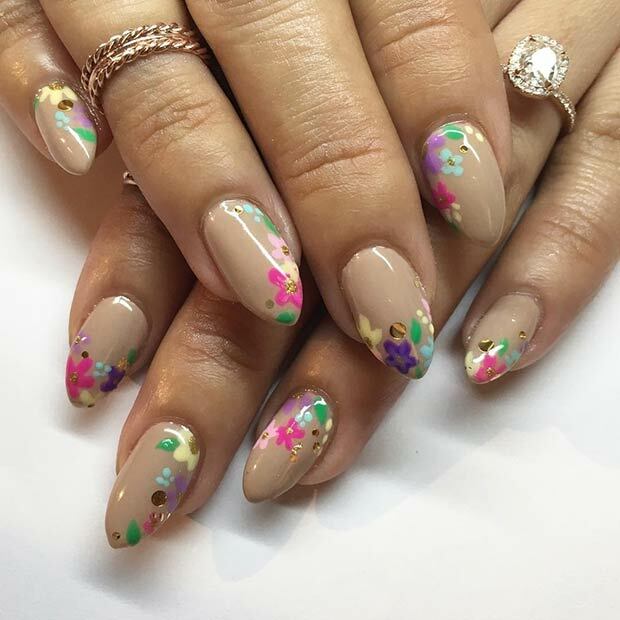 If you’re looking for floral nail art that is subtle then a design like this is for you. The nails have a simple clear coat of polish with delicate features. Sweeps of light green with strokes of purple create a flowery look. These will be a beautiful way to finish off any spring outfit. Just because color palettes are getting brighter for spring doesn’t mean that black should be ruled out. Black is a chic shade that suits everything. On this design a light pink has been used as a base color with a beautiful floral black pattern. Combine that with pink and silver glitter and you have one super stylish look. Now that winter is almost over nature is starting to blossom. 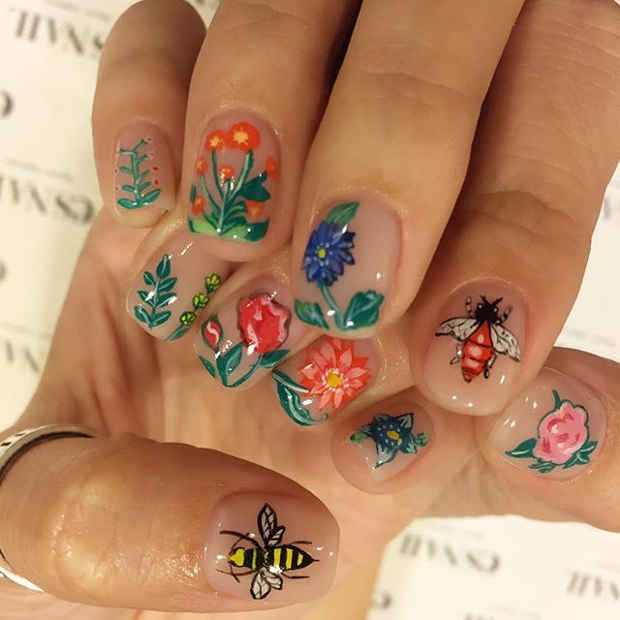 You can take inspiration from wildlife, green plants and vibrant flowers to create trendy nail art. With a clear coat of nail polish and some nail stickers you can easily create a look this one. If you’re feeling extra arty you could even try recreating the designs with nail pens. Tulips are beautiful and popular flowers. 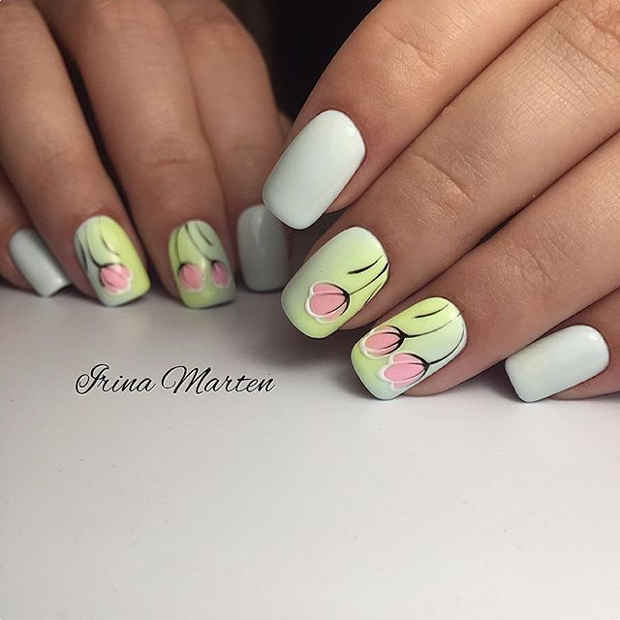 So, it is no surprise that tulips are being used in nail art. For this art, there is a soft sweep of spring yellow with a cute pink tulip design. This is another example of how white nails can be worn in different ways. Not confident with nail pens? Then we might have the perfect solution. With a design like this one all you need a is a bright polish like pink and a vibrant floral nail wrap. Nail wraps are easy to use and if you struggle there are helpful tutorials online. A nail wrap will last so is perfect for special occasions and vacations. Spring is a popular time for weddings. If you have a wedding or special occasion coming up, then nails like these would be a stylish choice. 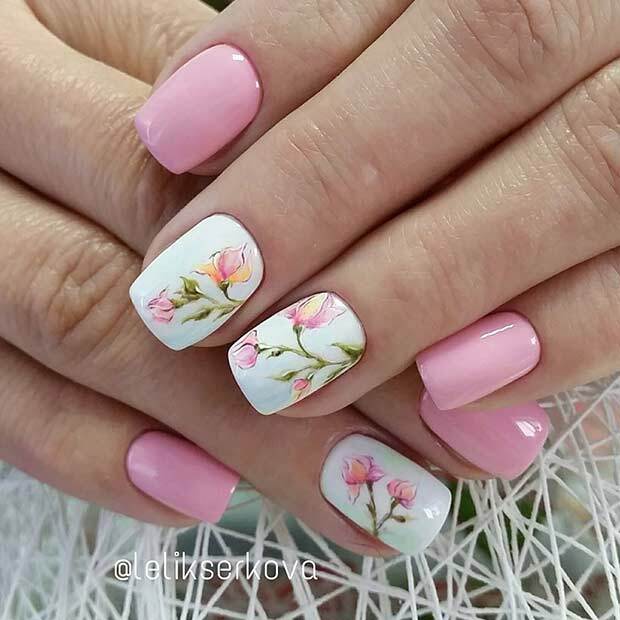 The feminine pink and white colors with the flower transfer is gorgeous. 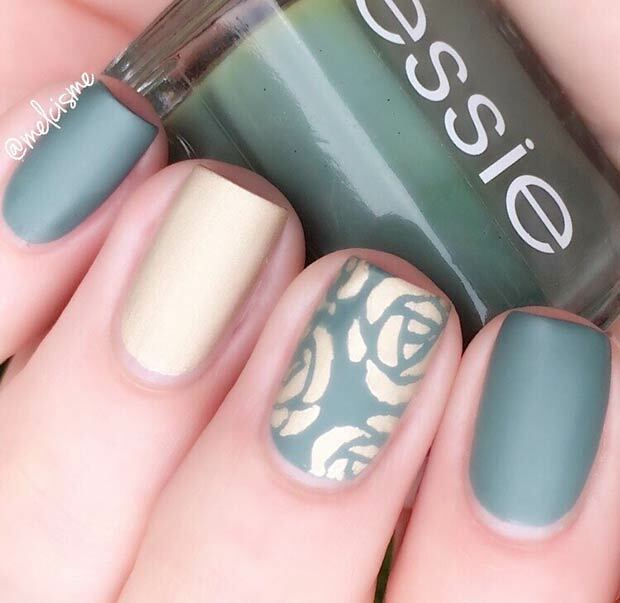 With a simple design like this you can experiment with different polish shades and flowers. 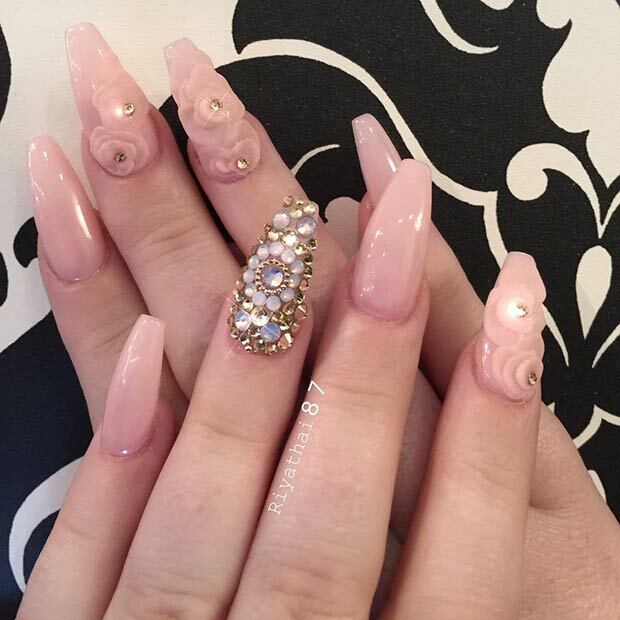 Gems are chic embellishments for nails. You don’t have to go overboard with the crystals you could go simple like in this design. One gold crystal on each nail brings the different elements of polishes and patterns together. Just make sure you keep the glue handy in case one falls off. 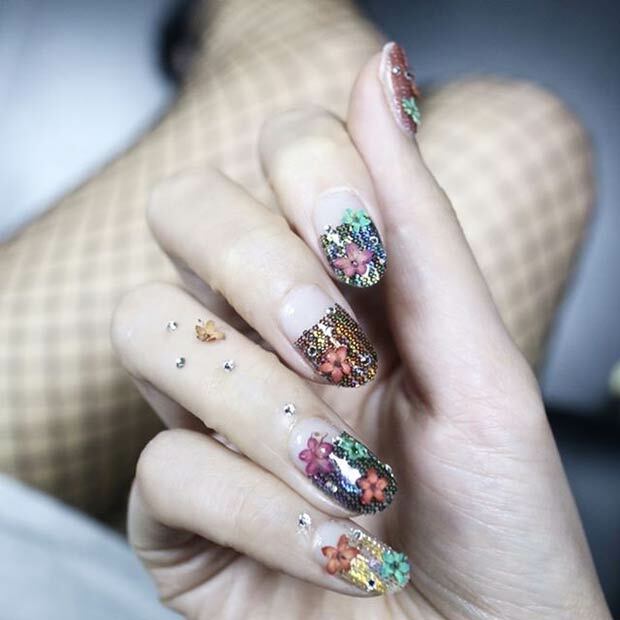 Adding floral patterns on different areas of each nail creates a unique and funky design. When creating nail art like this choose a neutral base color and build on top of it. Choose some bright nail pens and get drawing cute little flowers. With so many different shades and flowers to choose from your only limit is your imagination. When creating a fresh new nail design sometimes less can be more. You can create stunning designs without crystals and gems. 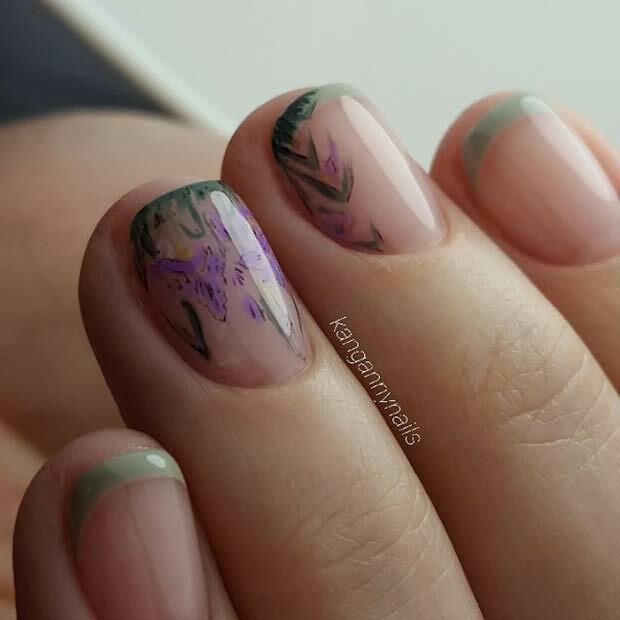 Just a simple clear manicure with a delicate floral transfer and you’re good to go. 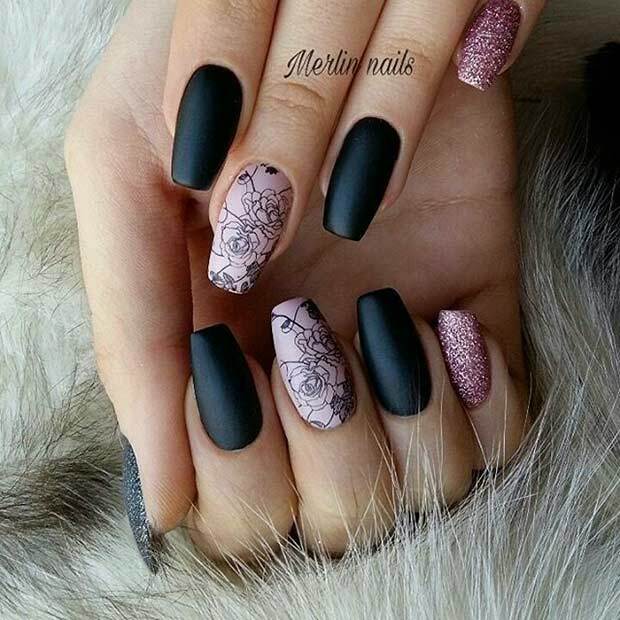 Nails like these will suit any outfit for any occasion. You can choose any spring time flower for this design. Now if crystals and statement making nails are your thing then this next design is for you. 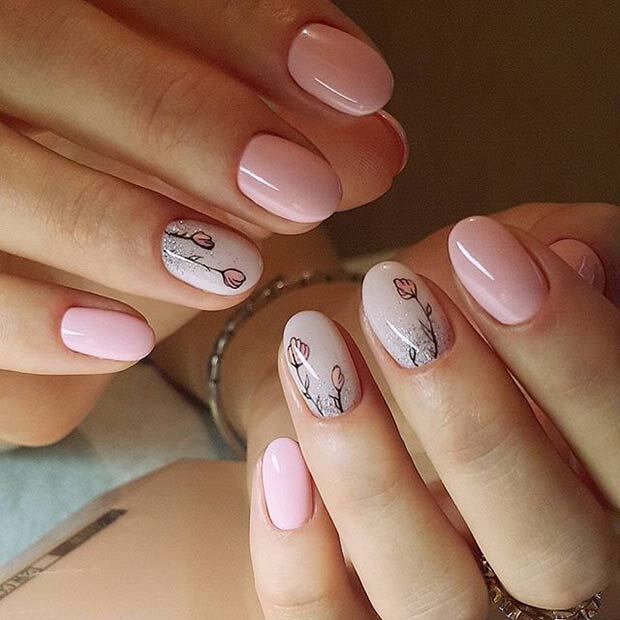 These nails feature a light pink shade with gorgeous 3D flowers. The one accent nail full of bling is gorgeous and will catch the eye when sparking in the spring sunshine! We ladies all like to add a little glamour to our outfits. These nails are just the way to do it. The purple will add a pop of color to your look and the stylish flower is the perfect finishing touch. This design will work for many shades so if you could even swap the purple for other vibrant tones or springtime pastels. 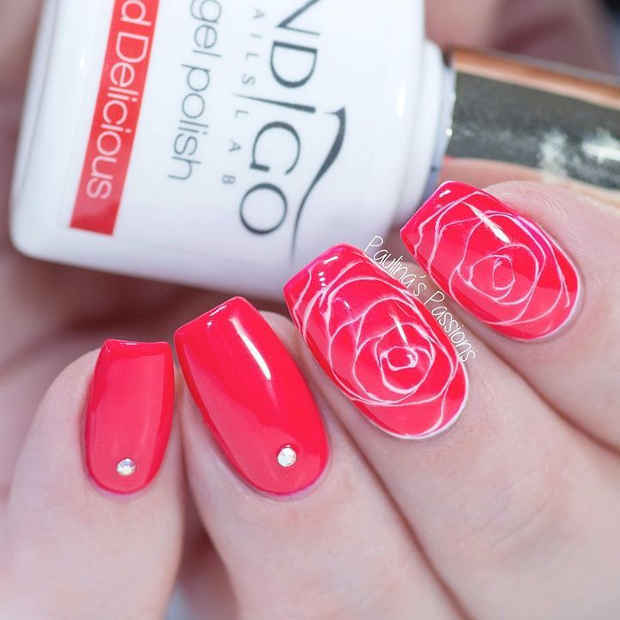 Roses have been a popular choice in nail art. Most of the designs are in pink or red shades but if you like to be a little different then try a design like this. The green and white are not conventional shades but work beautifully. There are nail stencils available to make it easy to recreate. Cute floral prints are always a fashion hit. 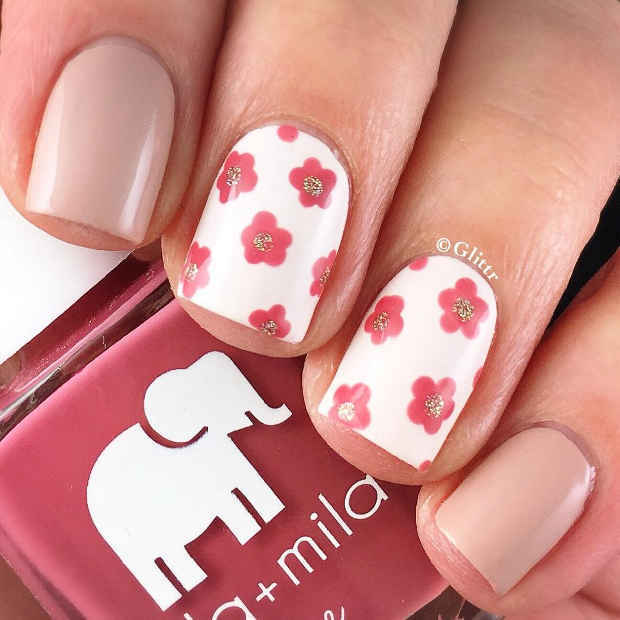 You can take inspiration from flowery patterns to create chic nail art like this. The flowers are gorgeous and the gold glitter in the center of each one is a nice touch. Pink is a huge trend for spring to pink polishes are a great choice. Here is another way to wear white polish. This design features a color palette of pink, purple, blue, white and black. These colors work so well together and are very stylish. The flowers look like a funky graphic design, perfect for any trendsetter. 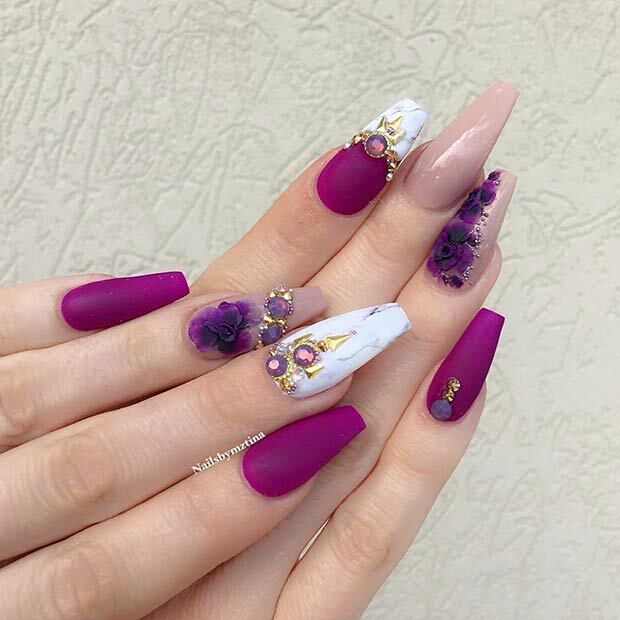 The next nails on the list are feminine and beautiful. The soft pink is a spring favourite and looks stunning with the delicate flowers. This design also has a sprinkle of silver glitter making these great for a special occasion. You could experiment with different glitters or none at all for a different look. Our last must have spring nail design features stunning pink roses. A nail design like this will brighten up any outfit ready for the new season. You could recreate with nail art pens or nail stickers. 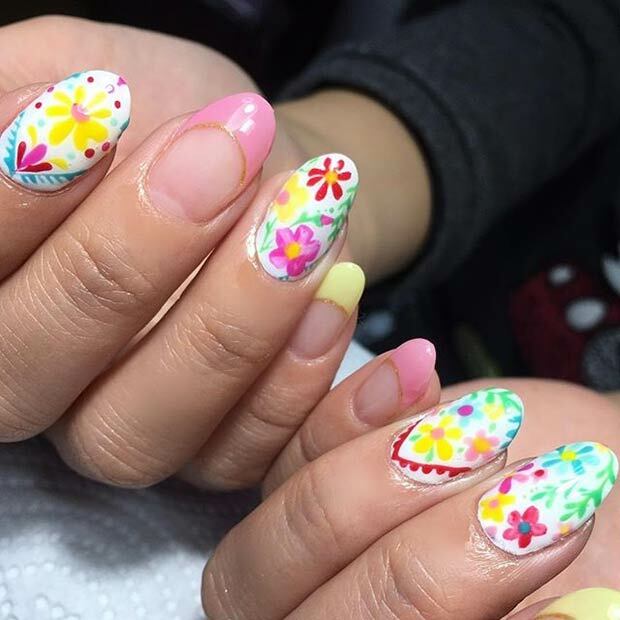 We hope you have found inspiration for your spring nail designs. We have and are off to try some of these out for ourselves!